Every now and then a project comes along that really gets the pulse racing. The conversion of the old dairy at Fordhall Farm at Market Drayton falls into just that category. It’s not every day we are invited to tender for the oak work on a nationally famous community farm owned by 8000 people! 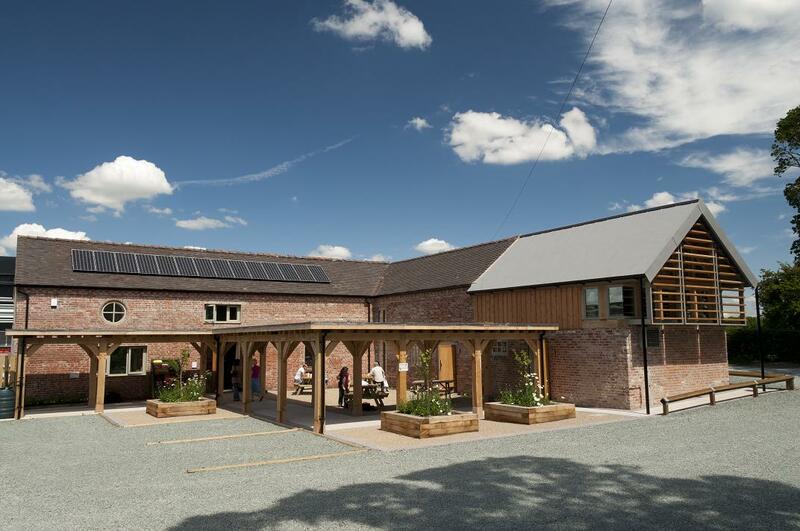 Charlotte and Ben Hollins had saved the family farm from the brink against all the odds, and had ambitious plans under the creative stewardship of Manchester architects Seven Architecture to redevelop the old farm buildings into a contemporary visitor centre, farm shop with strong eco credentials. It was a great honour to be selected to manufacture the massively imposing glazed oak gable, the oak framed turf roofed canopy, and the hayloft windows. This was an enormous and complicated project with tight deadlines. Things were not helped by one of the coldest and most protracted winters in a long time delaying the completion of the brickwork to accept the frame. You just can’t work with lime mortar when it’s freezing. Somehow the main contractor Shingler Homes pulled it all together on time and the oak frame went up in three separate stages. It was great to see the relief and satisfaction all round as things took shape, and a concept became reality. The results are a truly impressive vindication of the vision and determination of Ben and Charlotte whose refusal to compromise on quality should be an inspiration to us all.